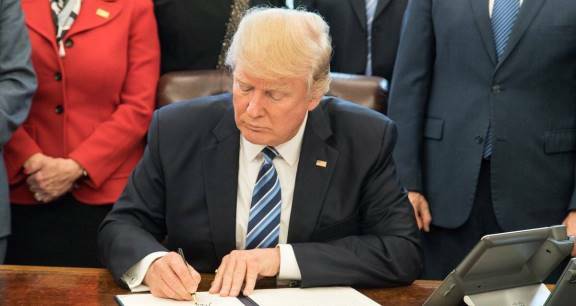 One of the very first actions Donald Trump took as president was to sign an executive order authorizing a federal hiring freeze (did not include the military). Conservatives applauded the move saying it was necessary to not only help keep the bloated federal budget under control, but also in theory to begin the process of paring down the size of the government. The massive federal workforce costs a lot of money. Even reducing the number of workers by a little will save tens of billions in the long run. Good work. The timing of the gesture could not have been an accident, since it took place on the first full workday of Trump’s administration, January 23. In so publicly making a statement on new federal hiring practices Trump was acknowledging things would be different under his presidency. But little did we know Trump was so serious about not bringing on any more federal workers that his administration would be hopelessly understaffed two months into his presidency – and this time it’s not all the Democrats’ fault either. John Fund of National Review wrote, “[W]hile Democrats did stall several Trump Cabinet picks, the vast majority of sub-Cabinet slots that require confirmation are vacant because of a personnel crisis in the Trump White House. And there are many such empty slots. Trump has named only 20 sub-Cabinet-level positions, including two who withdrew — a list that includes nominees for ambassadorships, counsel positions, and commissioners, according to a tracker from the Washington Post and Partnership for Public Service. In his article Fund notes the White House Office of Presidential Personnel currently has only 18 people working in it, a total completely inadequate to fill the impressive number of openings for political appointees (as pointed out above, the vast majority do not require Senate confirmation, meaning they just need to select people for the jobs). Trump himself indicated in an interview last month that he did not intend to fill some of the openings, saying he didn’t see a need for such a huge federal employee staff. “What do all these people do?” Trump asked rhetorically. Allow me to answer. For one, they help implement your policies, Mr. President. And two, they keep an eye on the so-called career federal worker bees who write regulations, interpret statutes, deal with citizens and the balance of tasks that bureaucrats do. Several cabinet secretaries have complained that they don’t have enough people to do the work, forcing them to keep Obama’s holdovers in place simply because they don’t have anyone else to handle the jobs. That’s a bad thing. According to Fund and other sources, Trump is insisting on filling even lower-level positions with people who supported him, purposely excluding Democrats or nefarious #NeverTrumpers. This is certainly understandable, but if Trump’s going to have such a policy he needs to ramp up his operations on the White House side to hire enough personnel staffers to screen out the improper applicants and still get good folks in place to turn the wheels of government. You’re not going to make America great again without an adequate number of great Americans to write the communications and sign the orders – and weed out the bad apples. And needless to say, keeping Obama’s ideologically driven Trump-haters onboard will only make matters worse. That’s the essence of the situation. By failing to properly staff his administration Trump is doing what he promised he’d never do – let the American people down. There are simply too many decisions on too many levels for a skeleton staff to handle. President Trump needs dedicated conservatives and supporters in those positions to properly execute his policies. The Office of Presidential Personnel should be beefed up accordingly. And by all means, let’s get those appointments to the Senate for confirmation. The Democrats will stall as usual, but at least the onus would be on them to come up with reasons why all these federal offices remain empty. Though President Donald Trump is definitely showing signs of wanting to hold down the size of the federal workforce, there is one area of the national government that can definitely use more recognition – that being the president’s announced creation of the “Office for Victims of Crimes Committed by Removable Aliens,” now called “Victims of Immigration Crime Engagement (VOICE)”. President Trump caused quite a stir among his Democrat onlookers when he briefly touched on the new VOICE program during his speech to the joint session of Congress two weeks ago. As if it weren’t obvious before, Democrats love to tout the “humanitarian” side of the illegal immigration issue yet completely ignore the victim side. They’re shameful. Luckily President Trump doesn’t share the same antipathy to documenting the truths about illegal immigration and helping the victims and their families cope. It goes without saying that the media reports endlessly on Trump’s campaign promise to build a “big beautiful wall” on the U.S.-Mexican border (and force Mexico to pay for it) while largely ignoring the reasons for needing a physical barrier in the first place. If hundreds of American political jurisdictions weren’t willing to aid and abet the illegal criminal offenders there wouldn’t be so much incentive for them to come – and stay – in the country to begin with. The VOICE office will collect and report statistics of illegal alien crimes to not only aid the victims of such violence but will also inform the public as to the extent of the problem and the need to end sanctuary cities. For so long the forces of political correctness (Democrats and the media) have only been reporting one side of the story with a very liberal perspective. Voters cannot make informed choices without hearing from the victims of illegal immigrants. That’s common sense. Though not directly related to the illegal immigration issue another less than politically correct assertion was made by Congressman Steve King over the weekend when he touched on the need for western countries to…have more babies. King insisted he wasn’t talking about race -- he was talking about culture. And he’s 100% correct. The same argument can easily be applied to many of these “sanctuary cities” which shelter illegal immigrants and discourage cultural assimilation. This is a larger argument for another time but not only are these people coming here illegally from other countries they’re treated to federal benefits in terms of cash, food stamps, education for their children and other programs designed to assist newcomers. And their babies are American citizens. You know, “anchor babies.” They may be American citizens but their parents through the widespread availability of non-English media maintain a cultural connection to wherever they came from. If you don’t believe it, take a look at the inner cities in California. Heck, even many of the locations in the San Fernando Valley where I grew up now appear more like third world countries with Spanish language billboards than anything in the United States. President Trump has started America on the path of reclaiming American culture and greatness, but there’s a long way to go and the Democrats and forces of the left will fight him every step of the way. Media says Trump’s political operation is slow to emerge, but does he really need it? There’s little doubt in today’s message-centric world of politics that some sort of promotional operation is essential to making sure important policies are getting a boost in the public’s eye. Without public opinion on your side your agenda isn’t going to go far – unless you’re the Democrats, of course (who pushed through Obamacare when few wanted it). Needless to say when Donald Trump was elected president several entities were quickly put together to help him promote his policies. Unfortunately for all involved, it looks like they’re a bit behind schedule. Shane Goldmacher of Politico reports, “A political group launched by some of President Donald Trump’s top campaign advisers to boost the White House in its biggest policy fights has been conspicuously absent as Trump begins to sell his agenda, hobbled by staffing delays, internal jockeying for control and a struggle to win the favor of big donors. According to Goldmacher there are a number of people inside the White House who are frustrated at the absence of message assistance from the group. My first thought upon reading this story was the media must be getting bored with covering the soap opera aspect of the White House staff so they’ve moved on to try and pick apart some other element of Trump’s political operation. It seems clear there is some establishment connection here, otherwise there wouldn’t be such a hubbub about a lack of public relations help when Trump himself is in the White House and is his own best advocate for his own policies. As of yesterday Trump has 26.2 million Twitter followers and counts just about 21.5 million likes on his Facebook page. Granted there are a lot of overlaps here but Trump has the capability of reaching upwards of 30 million people almost instantly. I’ve venture to say there isn’t a television entity in the country that reaches that many at any particular time and it takes months if not years to build up a social media following. President Trump would certainly be aided by a competent political cheerleading group but it isn’t absolutely essential. There are already plenty of capable individuals close to Trump who can help disseminate his message. In this realm “paid media” is only a small part of it. If Trump keeps the conservative grassroots happy, his policies will succeed. Assessing where the base is at on key issues is what he needs. In a lot of ways he’s already there.